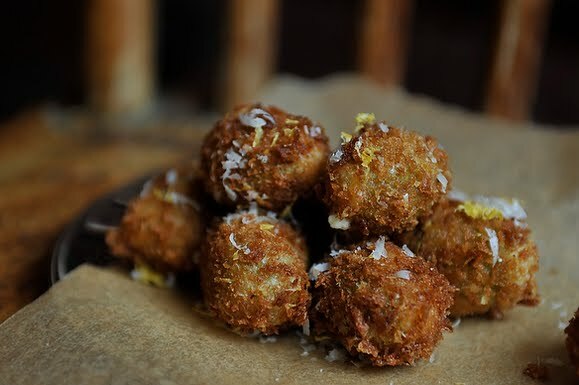 My fried olive recipe is a finalist for this week’s Food52 contest, but that’s not all! My competition is none other than my sister, Helen!! The folks over at Food52 selected our recipes from the 68 entries for the “Your Best Movie Snack” contest, and then realized that they had created the first ever Sister Showdown! Helen and I are both thrilled to be finalists. She’s been super awesome too, asking all our friends and family to vote for me, since she has already won one Food52 contest, and will be in the cookbook for her Figgy Pudding Butter Cookies. I have a feeling little sister is going to make it two with this one, since her bacon-wrapped, cream cheese-filled hatch peppers are almost universally adored, but it’s been a blast being a finalist with her! Congratulations, sister!